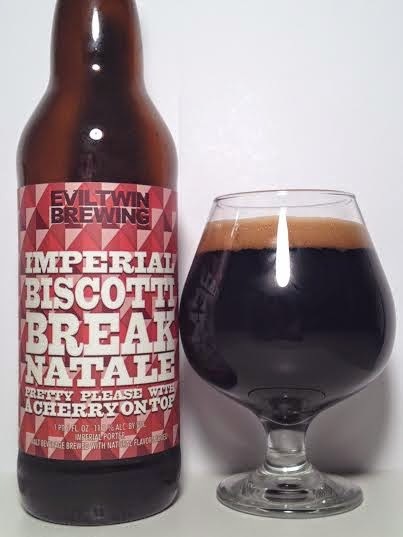 Imperial Biscotti Break is on of my favorite offerings from Evil Twin. This version adds sour cherries to the mix in an attempt to compliment the robust coffee and chocolate flavors of the original beer. Pours like Shane Diesel - a pitch black base with a dark brown head. The aroma is the familiar Imperial Biscotti Break that I know and love. Creamy milk chocolate and roasted coffee with tons of malty goodness. The cherries aren't in your face and are subdued in the mix of all the other flavors. While the cherries weren't the first noticeable flavor on the aroma, the complete opposite is true for the taste. Immediately I am hit with sour cherries all the way from front to back. I still get a lot of roasted notes, but those chocolate and coffee flavors have taken a backseat to the "cherry on top". Like its predecessor, this is a thick, creamy, and fluffy mouthfeel that coats your entire mouth. At 11.50% the alcohol is nearly undetectable and the drinkability is quite high for the abv and style. Adding cherries to an already winning formula didn't take the beer to a new level, but instead it made a sweet beer sweeter. The cherries came through loud and clear on the taste, but their presence can be overpowering and they tend to linger on the aftertaste more than I wish they did. In the end, this is a good offering from Evil Twin, but I would stick to the regular Imperial Biscotti Break any day.